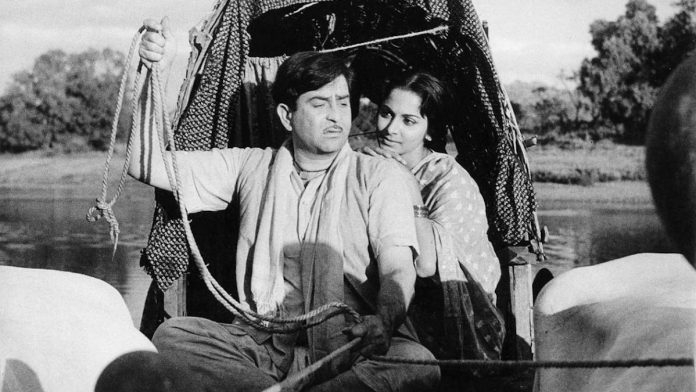 The first time the audience gets a glimpse of Waheeda Rehman in Teesri Kasam, a character on screen exclaims, “Arre, ye to pari hai.” Hiraman, a bullock cart driver played by Raj Kapoor, was actually speaking about his passenger Hirabai. But his exclamation might as well have been a comment on Rehman’s presence in Indian films. ‘A fairy’, as he calls her, is a graceful and powerful metaphor in popular imagination. In Rehman’s case, the grace and dignity she brought to Hindi film screen over the years became unavoidable clichés to describe her. In Basu Bhattacharya’s Teesri Kasam (1966), which released a year after her memorable turn in Guide, Rehman played a character that has since acquired an iconic status. 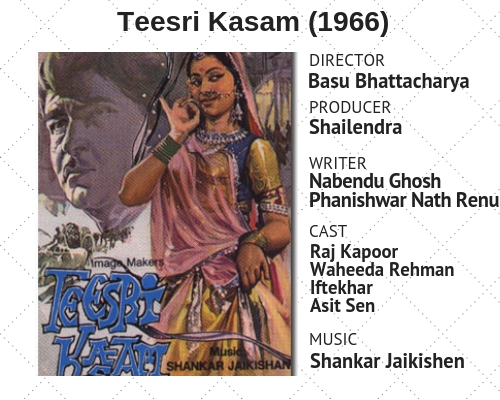 A commercial failure at the time of its release, Teesri Kasam was produced by lyricist Shailendra, possibly to infuse a bit of literary quality in Hindi cinema. Litterateur Phanishwar Nath Renu penned the story and dialogue, based on his 1954 short story, Maare Gaye Gulfam. The basic premise of the story is the bond that Hiraman and Hirabai form during a 30-hour journey in the northern belt and over subsequent days — not a novel idea, and in fact, something filmmaker Imtiaz Ali has turned into an industry in the last decade. While Teesri Kasam might just have been a tale of another doomed love story, the social status of its protagonists, and its melancholic tone, added layers to the film’s texture. Hiraman is a country bumpkin, the kind of role Kapoor made a living out of. When police catch him with black-market goods, he vows to keep off them. When he meets with an accident while carrying a bamboo, he promises to never carry a bamboo again. Hiraman is a conservative simpleton, one who sings philosophical musings about the value of truth — “Sajan re jhooth mat bolo, khuda ke paas jaana hai…” and karma — “Bhalaa kije bhalaa hoga, bura kije bura hoga“. It is then quite obvious for the drama to feature a character that stands for something other than the untainted innocence of Hiraman. This becomes Hirabai. Both have similar first names — Renu’s comment on their similar destinies — a fact that Hirabai finds amusing. Hiraman is easily scared — he prays to God to save him when he (initially) suspects that the passenger in his cart was some ‘pishach’ (demon). Hirabai finds this charming. She has always been surrounded by men who might have been demons themselves. On their journey to a village fair, where Hirabai is supposed to join her nautanki company, both experience something novel. He, who has been single all his life, has never spent so much time in proximity with another woman. Neither has she been in the company of another man who sees the ‘devi’ (Goddess) in her. So she play-acts. Seeing that he is besotted, she ‘plays’ the woman of his dreams — after all, that’s what she does for a living, without much societal approval. But at some point, she becomes too immersed in this real-life play and starts to believe it. Once she reaches her destination, she asks him to stay back for a few days, ‘see’ her nautanki company. She finds excuses to meet him, talk to him, and also gets him to attend her plays. It is at the play that Hiraman first gets a sense of the difference that exists between them after an audience member leers at her lecherously. Hiraman picks a fight with him only to be scolded by Hirabai. So, she leaves, inevitably. And Hiraman takes his third vow — never to ferry another nautanki company passenger. Also read: As India mourns legendary Neeraj, is the era of poetry over in Bollywood music? In the beautifully shot film by cinematographer Subrata Mitra of the Apu trilogy fame, the actors bring dignity to their parts with fully realised performances. Notice Rehman’s change of tone when she speaks to Hiraman and when she speaks to everyone else. Kapoor himself has played similar parts before, and to much greater effect, but here he plays the perfect foil to Rehman’s incredibly heartbreaking rendition. Bhattacharya, who went on to make several other acclaimed works, could never repeat the honesty portrayed in this film, perhaps attributable to its poetic quality. That poetry could be created, not in the least, courtesy the 10 songs (many composed like folk songs) by Shankar-Jaikishen and Shailendra. The profound work in all the songs belongs more in a book than in a Hindi film. Shailendra — hailed as perhaps the greatest Hindi lyricist of all time by greats like Gulzar and Javed Akhtar — produced this film despite much advice to the contrary. The film won a National Award but its crushing failure had already killed him before that. Few lyricists attempted to produce a film ever again. The copy has been updated to reflect changes. In India many such gems ie movies have failed commercialy and that is why people do not attempt to make good films, thus no big acclaimed movies from India having a global appeal or name are known. This movie was a gem. The exquisitely beautiful Waheeda Rehman turned 81 recently. Raj Kapoor left too early, much before his contemporaries, Dev Anand and Dilip Kumar.